On site Metal Stitching process is successful for repair of cracks developed in heavy engineering equipments in operation in power plants cement, chemicals,fertilizers etc. 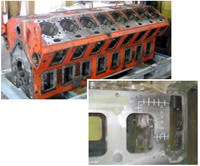 Our system holds expertise in providing the Metal Stitching of Cylinder Heads. Crack Repair by Metal Stitching is a cold and to proven system. We do metal stitching of Turbocharger casing, forging presses and heavy castings. Metal stitching is a precise mechanical method of making permanent repairs to broken casting and machine parts. No heat is used in metal stitching process, thus no stresses are introduced and no post-repair machining is necessary to correct misalignment and warpage. Since there is no heat, metal locking repairs can be made in restricted areas where flames or welding arc is prohibited Repairs are done on location in the plant, without the necessity of major dis-assembly. 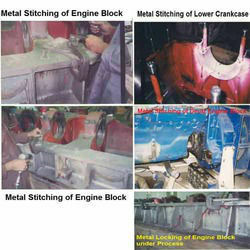 We are undertaking metal stitching for our esteemed clients based in domestic and international market. 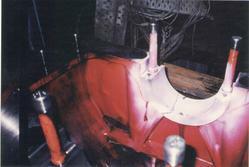 We carry out the repair in cold process therefore; no distortion or thermal stress is induced. We also import metal stitching “locks", master-locks" and "plugs from U.K.
We are offering Metal Stitching of Engine Block Services to our highly valued clients. No heat is used, thus no stresses are introduced and no post-repair machining is necessary to correct misalignment and warpage. Since there is no heat, metal locking repairs can be made in restricted areas where flames or welding arc is prohibited Repairs are done on location in the plant, without the necessity of major dis-assembly. These are easily available at market feasible prices.